Allied forces begin to take large numbers of Axis prisoners: The total number of prisoners taken on the Western Front in April by the Western Allies was 1,500,000. April also witnessed the capture of at least 120,000 German troops by the Western Allies in the last campaign of the war in Italy. In the three or four months up to the end of April, over 800,000 German soldiers surrendered on the Eastern Front. In early April, the first Allied-governed Rheinwiesenlagers were established in western Germany to hold hundreds of thousands of captured or surrendered Axis Forces personnel. Supreme Headquarters Allied Expeditionary Force (SHAEF) reclassified all prisoners as Disarmed Enemy Forces, not POWs (prisoners of war). The legal fiction circumvented provisions under the Geneva Convention of 1929 on the treatment of former combatants. By October, thousands had died in the camps from starvation, exposure and disease. Concentration camps and refugees : In the last months of the war and immediately afterwards, Allied soldiers discovered a number of Nazi concentration camps and forced labor facilities that were responsible for the deaths of an estimated 11 million people, six million of whom were Jews. Romanis, Slavs, homosexuals, and various minorities and disabled persons, as well as political enemies of the Nazi regime (particularly communists) formed the remaining five million. Mussolini's death: On 27 April 1945, as Allied forces closed in on Milan, Italian dictator Benito Mussolini was captured by Italian partisans. It is disputed whether he was trying to flee from Italy to Switzerland (he was on the wrong road) and was traveling with a German anti-aircraft battalion. On 28 April, Mussolini was executed in Giulino (a civil parish of Mezzegra); the other Fascists captured with him were taken to Dongo and executed there. The bodies were then taken to Milan and hung up on the Piazzale Loreto of the city. On 29 April, Rodolfo Graziani surrendered all Fascist Italian armed forces at Caserta. This included Army Group Liguria. Graziani was the Minister of Defence for Mussolini's Italian Social Republic . German forces in Berlin surrender: The Battle of Berlin ended on 2 May. On that date, General der Artillerie Helmuth Weidling, the commander of the Berlin Defense Area, unconditionally surrendered the city to General Vasily Chuikov of the Soviet army. On the same day the officers commanding the two armies of Army Group Vistula north of Berlin, (General Kurt von Tippelskirch, commander of the German 21st Army and General Hasso von Manteuffel, commander of Third Panzer Army), surrendered to the Western Allies. 2 May is also believed to have been the day when Hitler's deputy Martin Bormann died, from the account of Artur Axmann who witnessed Bormann's death in Berlin near its Lehrter Bahnhof railway station after encountering a Soviet Red Army patrol. Lehrter Bahnhof is close to where the remains of Bormann, confirmed as his by a DNA test in 1998, were unearthed on 7 December 1972. Hermann Göring's surrender: On 6 May, Reichsmarshall and Hitler's second-in-command, Hermann Göring, surrendered to Carl Andrew Spaatz who was the commander of the operational United States Air Forces in Europe, along with his wife and daughter at the Germany-Austria border. He was by this time the most powerful Nazi official still alive. VE-Day: News of the imminent surrender broke in the West on 8 May, and celebrations erupted throughout Europe. In the US, Americans awoke to the news and declared 8 May V-E Day. As the Soviet Union was to the east of Germany it was 9 May Moscow Time when the German military surrender became effective, which is why Russia and many other European countries east of Germany commemorate Victory Day on 9 May. A small group of German soldiers deployed on Bear Island in Operation Haudegen to establish and man a weather station there lost radio contact in May 1945; they surrendered to some Norwegian seal hunters on 4 September, two days after the Surrender of Japan. The Allied zones of occupation in post-war Germany, highlighting the Soviet zone (red), the inner German border (heavy black line) and the zone from which British and American troops withdrew in July 1945 (purple). The provincial boundaries are those of pre-Nazi Weimar Germany, before the present Länder were established. End of state of war with Germany was declared by many former Western Allies in 1950. In the Petersberg Agreement of 22 November 1949, it was noted that the West German government wanted an end to the state of war, but the request could not be granted. 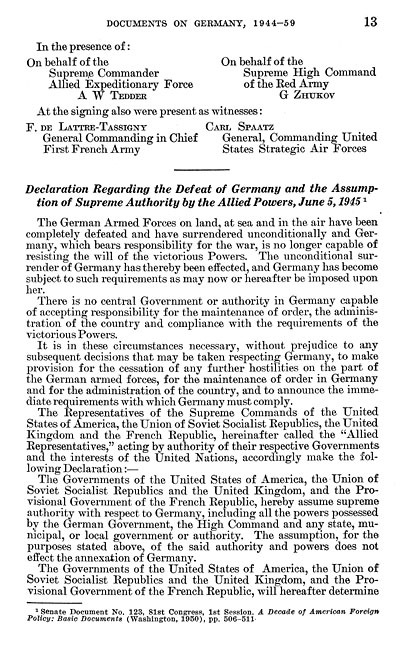 The US state of war with Germany was being maintained for legal reasons, and though it was softened somewhat it was not suspended since "the U.S. wants to retain a legal basis for keeping a U.S. force in Western Germany". At a meeting for the Foreign Ministers of France, the UK, and the US in New York from 12 September – 19 December 1950, it was stated that among other measures to strengthen West Germany's position in the Cold War that the western allies would "end by legislation the state of war with Germany". In 1951, many former Western Allies did end their state of war with Germany: Australia (9 July), Canada, Italy, New Zealand, the Netherlands (26 July), South Africa, the United Kingdom (9 July), and the United States (19 October). The state of war between Germany and the Soviet Union was ended in early 1955. Treaty on the Final Settlement with Respect to Germany: Under the terms of this peace treaty, the Four Powers renounced all rights they formerly held in Germany, including Berlin. As a result, Germany became fully sovereign on 15 March 1991. Under the terms of the Treaty, the Allies were allowed to keep troops in Berlin until the end of 1994 (articles 4 and 5). In accordance with the Treaty, occupying troops were withdrawn by that deadline. Germany remains however without the normal protection of the UN charter due to articles 53 and 107 in the charter which has not been amended since the end of the war. ↑ 21.0 21.1 21.2 Ziemke 1969, p. 130. ↑ 23.0 23.1 Plenipotentiaries 1945, p. 1 (3 PDF). This page was last modified on 8 December 2015, at 14:34.